We are in the middle of a publishing revolution, traditionally it was a long hard road to become a published author and the path was paved with rejections slips. Publishing a book is a big job and publishing houses don’t have the resources to print all the books that are sent to them. Instead they have to be picky, usually deciding whether or not a book is sellable within the first few sentences. It’s a competitive market and a lot of bestselling books were rejected by numerous publishing houses before someone agreed to take them on. For an unknown author the chances of getting a foot in the door are pretty slim. These days with the power of social media and the internet, doing it yourself is perfectly achievable. I’ve been reading since I was a child, I know books and felt confident I could produce one with a completely professional look. I knew the first place I had to start was with the cover, it’s a cliché we’ve all heard before, ‘never judge a book by its cover’ but let’s face it, we all do. I searched long and hard for a cover artist for The Shadow Series and eventually decided on award winning designer Damon ZA. He was more expensive than other artists I’d found but he made an offer that was impossible to turn down. Two covers to choose from and unlimited changes until you were happy with the finished product. It’s pretty scary having someone put a cover to your book so the added security of unlimited changes was what sold me. Now I don’t think I could work with anyone else. He was creative and fast, I gave him full artistic reign and he produced the four amazing covers with just brief book descriptions to work with. I honestly couldn’t be happier with the finished product. Writing the blurbs—that short paragraph on the back of the book—was one of the hardest things! I wrote so many and had numerous people critique them for me but it didn’t make the decision any easier. How do you use one paragraph to sum up an entire novel? And how do you make it intriguing without giving too much away? That little project in itself was a major time drainer. As a reader you don’t often think about who wrote the blurb and yet that’s the paragraph that draws you in. If it’s bad—forget about it. That’s a lot of pressure to work under! Same with book titles, they did undergo a few changes, it’s hard to get the balance just right. I wanted four titles that went well as a set but I also had to make sure they sounded like they were the right genre. Then when it came down to formatting I had no idea of the drama I would face, I had to do two versions: a print and an ebook. They are completely different so there’s no way to get away with doing it just once. Even little things like choosing the font is difficult, it does actually make a difference in the readability of a book. If the letters are too close together it’s hard on the eyes, you don’t want it too big or too small and it’s important to watch out for tricky letters like w and x, they have a habit of running together. There are also a lot of fiddly things like choosing margin sizing, headers and footers, the positioning of your chapters and section breaks. Indents are a big one, a large indent looks ridiculous and if you pick up a book you will notice the first line in a new paragraph or chapter isn’t indented, how on earth do you set your computer to do that? I learnt a lot in the process of formatting the print book. I spent a lot of time working on the front matter: the title page, copyright page, the acknowledgements and dedication. I made mistakes like adding the front matter without formatting section breaks then I couldn’t set the headers and footers to skip the first few pages. All these little details impact the overall impression of a book, all I can say is, I don’t know where I’d be without Google! And there were more hurdles after that. I needed my word document to be a PDF but all the programs I tried for conversion changed the custom page sizes back to A4 and then threw out all my formatting. I had a friend with Adobe which automatically registered my custom pages but his computer didn’t have the same font I’d used and once again it threw my formatting out. There was always a solution but it was certainly a test of patience. Once the print version had gone to the printer I focused my attention on the ebooks, I published through Smashwords which offers a step by step guide to formatting, it was time consuming but I didn’t run into any major problems. My main fear with the ebooks is that there is no set appearance. With the print book I formatted everything and I know exactly where every indent or space is going to sit. With an ebook it’s not that simple, they are designed to be read on multiple devices so it will look different depending on whether it’s read on a phone or an ereader. Then there’s Amazon *insert a big sigh of frustration here* oh Amazon. I don’t know why they make it so hard! 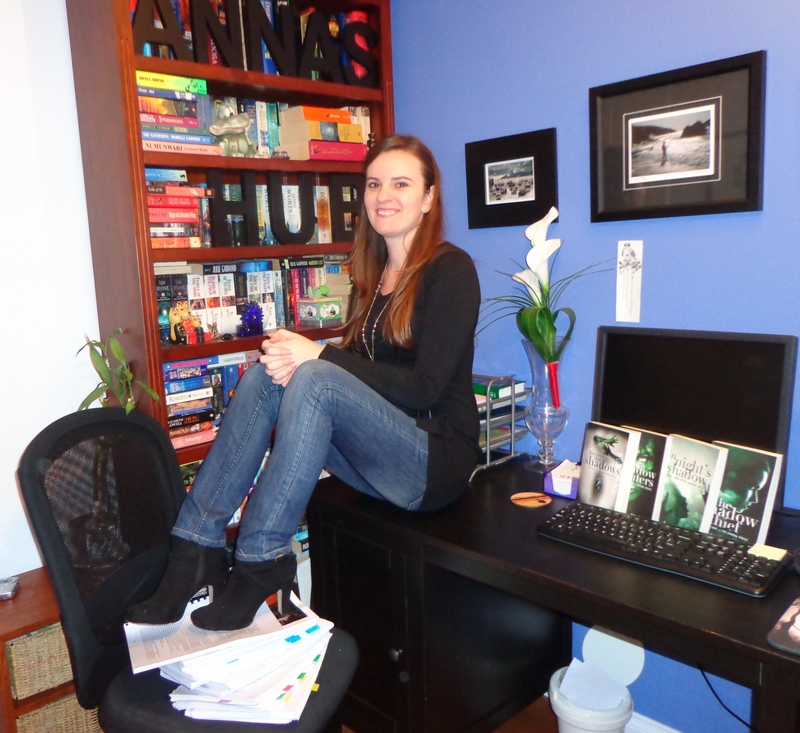 They offer a program called KDP where you can publish your ebook to their kindle store. Months before I even reached this stage I did a lot of research and found that Amazon also liked to make you exclusive. Meaning that once you publish with them you can’t publish with anyone else. Amazon’s great for people who own a Kindle but what about people who have an ipad or other ereader? Being exclusive to Amazon would mean other people couldn’t read my books. I knew authors who were published on both Amazon and Smashwords so I knew it was possible. I spent many frustrated hours searching for the loop hole, in the end I have to thank my Goodreads author buddies for pointing me in the right direction. It turns out when you sign up for Amazon’s KDP program there is a little box waiting to be checked. If you tick it you’re exclusive, if you ignore it you can publish wherever you want. It’s so simple but Amazon made it very difficult to find that information. So I thought I was good to go but when I tried to sign up for their program I discovered you can’t sell on Amazon with an Australian bank account, you need an account in an Amazon supported country. I had a traumatic couple of days trying to figure out how I was going to manage that. I was then thrilled to learn I already had a UK bank account set up by my grandad when I was child. Still that wasn’t good enough, the account had to be credit not savings. My sister currently lives in Ireland and she suggested I use her Irish account as she’ll be moving to Australia in a couple of months. Even trying to enter her details involved converted account numbers to internationally recognised numbers. And that’s not it. Selling a product in the US means you need a US tax number. But I’m Australian and I’ll be taxed by my own country for my earnings. In that case I need a tax exemption. I had a pretty amusing phone conversation with an American guy working for the IRS, I could barely understand what he was telling me but in the end I found out what I needed to do. I filled out their forms and sent my proof of ID to Texas, now I wait 10 weeks for a tax number, then apply to Amazon and Smashwords for my tax exemption. All of it is achievable but I felt like every time I solved one problem there was another waiting for me, when I finally got to the point of uploading my books to Amazon I was literally skipping around the house in celebration. I made it! As I am now a small business owner there is also the book keeping and tax details to get through but all of that will come, my website is up and running, the books are in stock and waiting to go. Now I just have to focus on book promotion and doing as much as I possibly can to get my books out in the public. So many people have helped me on this great adventure, I want to thank every single person who has played a part. All the people already mentioned in this blog series, a huge thank you to my brother in law for his hard work on my website, my family and friends for their ongoing support, my amazing boyfriend for showing me the ropes when it comes to marketing and receiving feedback on an artistic creation. For many years I kept my writing life separate from the rest of life but merging the two has made me feel complete and I’m stunned by the new opportunities crossing my path. Tomorrow is the big day, a quadruple book launch, I’m ready! 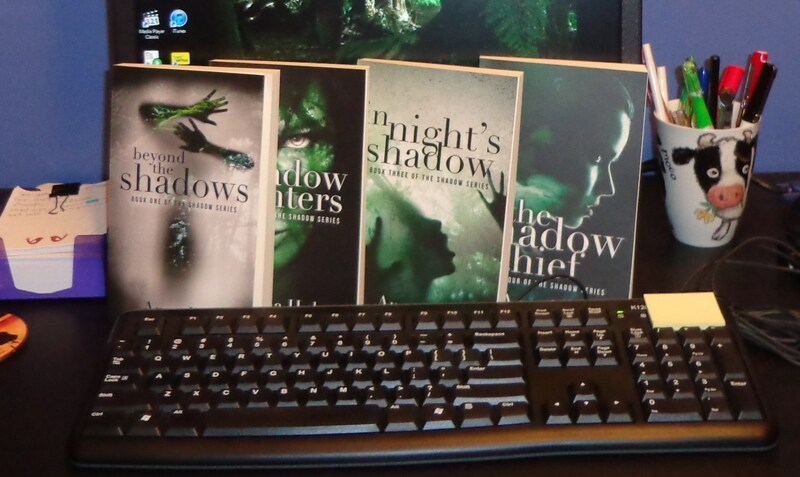 In celebration of the release of The Shadow Series, what better topic to blog about than the creation of the books? Consider this the literary version of an audio commentary. In this blog you will learn about the finer details; where the inspiration came from, how I planned the storyline, the editing and finally the publishing (to be published as a three part series). Just like any other art form there is a lot of work going on behind the scenes and here’s where you get a sneak peak. I actually started writing this blog back in 2011, it was more of a diary for my own records, at the time I had no idea I would publish it in the days leading up to the series launch. This journey has been the single most rewarding experience of my life and you’re about to get a little taste of the work that has gone into creating it. In 2009 I had just finished working on a two year project, it was my first novel, which in all honesty was meant to be my only novel. 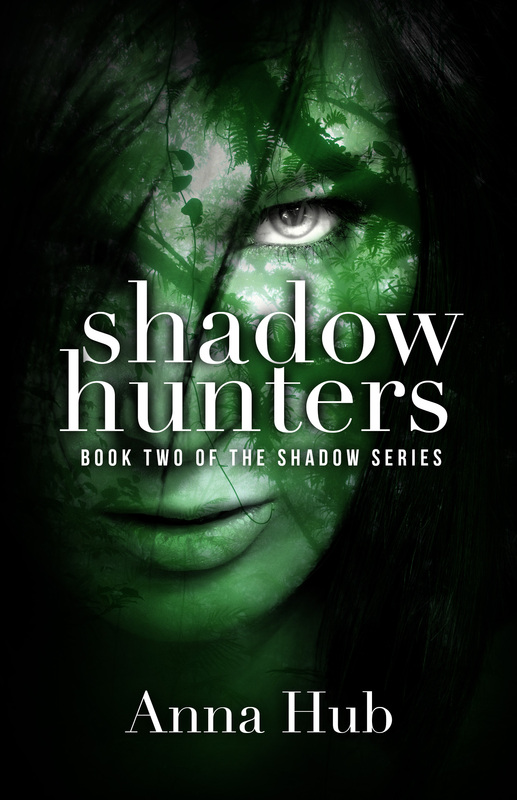 I was in the process of editing that book when I started thinking about the concept for The Shadow Series. I can’t remember exactly what brought my attention to shadows but that single topic is literally the entire basis of this storyline. Shadows are constantly used to represent fear of the unknown in an audience whether it be via movies, music or performance and I was feeling the draw towards a topic that could instil a sense of fear in a reader. I wanted to work on something dark and mysterious not just to scare them but to use it as a contrast for the light. I wanted to take my character to the very edge of her survival ability and then see how she could overcome it. 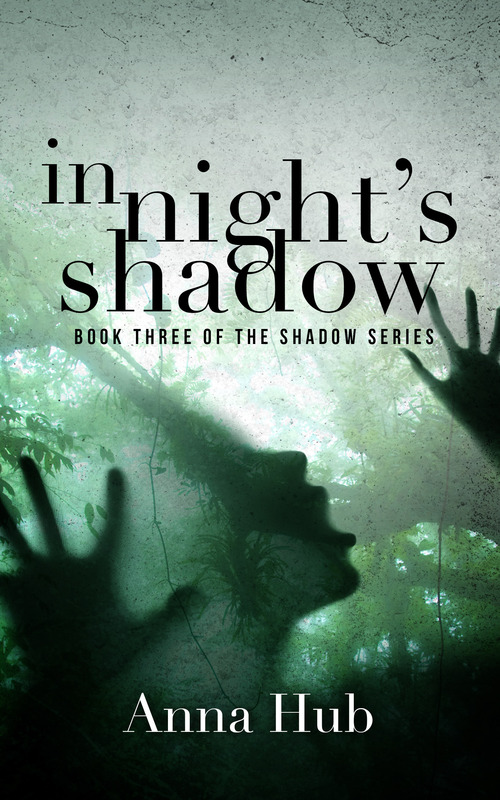 Shadows were always going to be the focus of the story, I knew that from the beginning but it took weeks of planning for me to decide exactly how I was going to turn that subject from a psychological thriller into a fantasy novel. 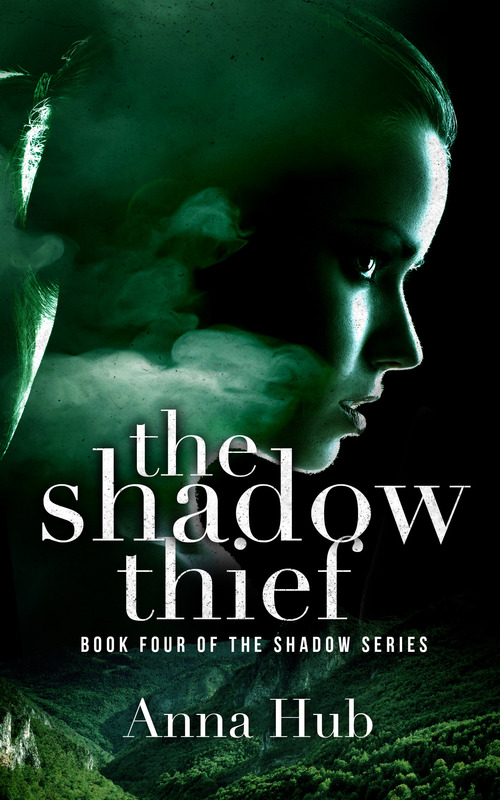 I worked with the idea of my protagonist being afraid of her shadow, it was the perfect way to make her utterly powerless, no matter how fast she ran or how hard she tried to escape it her shadow would always be one step behind her. To bring the fantasy genre into it I made the shadow responsible for transporting the characters into an alternate universe, where there is no civilisation and the forest is filled with wild animals and soulless men who hunt humans. It wasn’t a psychological thriller if the phenomenon was really happening. In my mind it was always a series, I’d written a standalone book and I wanted to try something a little more challenging. As soon as the characters were created in my head the storyline seemed to unfold on its own. For me the hardest thing about writing a book is coming up with the initial concept, once that’s done the ideas seem to reproduce and before long I’m thinking of them faster than I can write them down. I knew exactly how the story was going to end before I even started writing it—it gave me a sense of purpose, a clear direction, and made the writing process faster than I thought possible. The first draft came out in a bit of a frenzy, words can’t really describe the exhilarating feeling of the all those ideas swimming around in my head while I was writing. It was almost like I was living the life of my character, every time she was running I was running, when she was afraid I felt it, when she was emotionally distraught my own heart was racing and by the end of the day I had lived 12 hours in this amazing and terrifying world known as the Shadowlands. Writing this series took my desire to be a writer to a whole new level, at the time I was feeling a little lost in my career choice to be a nurse and the days I spent writing made me feel more alive than ever. It amazed me how I could spend hours in this tense and emotional state with my character and yet I felt so strong—no matter how much time I spent on it writing didn’t seem to tire me out it actually gave me more energy. 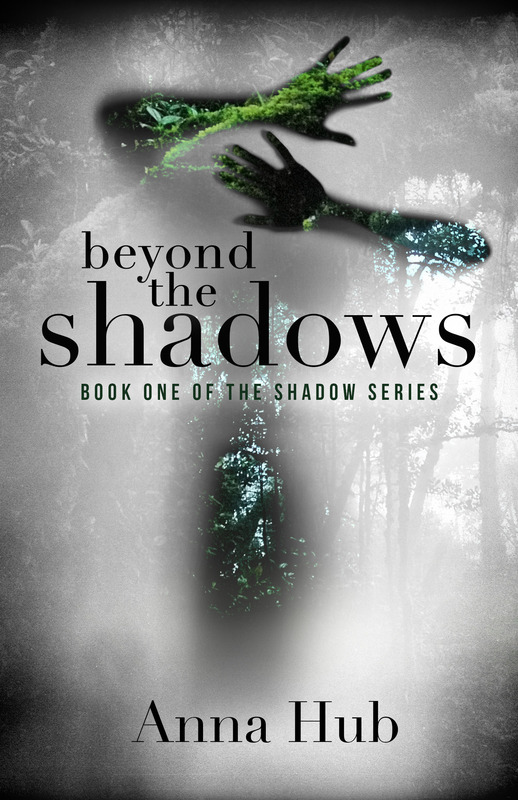 It took me four months to write the draft of Beyond the Shadows and in that time something clicked into place, I knew I’d found exactly what I was looking for in life and there was no going back. With my previous book I only allowed one person to read it, my sister, and it wasn’t until it was completely finished and edited that I sent it to her. For Beyond the Shadows I decided to change that tactic. I sent the first few chapters to my friend Kate, in hindsight I wouldn’t do it again because stopping to edit part way through stunted the writing process, but Kate’s advice had a huge impact on the structure of the book. She made me realise there was too much information being stuffed in the readers’ face and when I worked with the ‘less is more’ approach things shuffled into their rightful place. The entire series would be very different if it wasn’t for that change so she deserves an appropriate shout out. Thanks Kate! When the draft was finished I shared it amongst friends and family, all of whom gave me amazing support and advice. Thanks to the first readers; Sarah, Mum, Kuch, Annette, Roz, Rachel, Frances, Sue and Jean, your enthusiasm and suggestions helped spur me on, I saved absolutely every piece of advice you gave me and it helped shape the future of the characters. 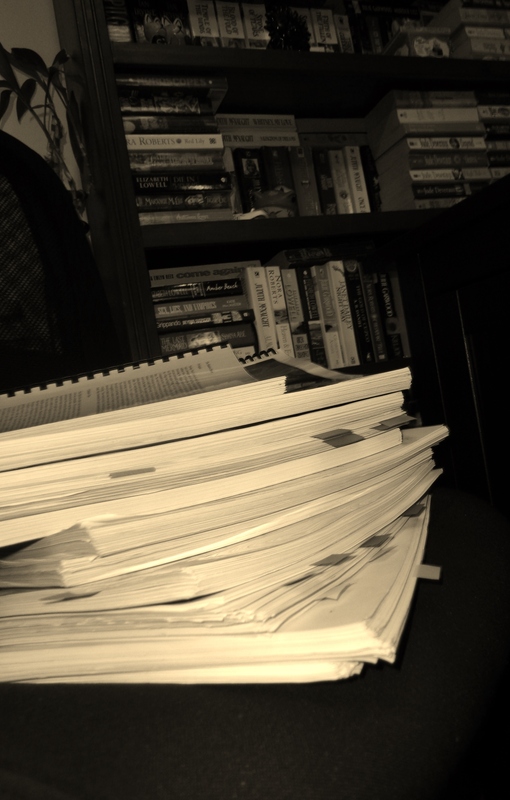 The draft manuscripts used for editing. I truly don’t remember the exact number of times I edited that first book, I know it was at least four and that was before I even decided to publish it—more on that later. The second book in the series burst out of me at an alarming speed, it took three months to write the draft but it was probably so easy because the characters and their world was already created, plus I’d figured out a pretty good writing rhythm. During this time I did all the cliché things you think a writer would do. I worked way past midnight, I fell asleep with notebooks on my chest, I woke up in the middle of the night to record new ideas, I shut the door and snapped at people who tried to interrupt me. I read an SAS Survival Guide from cover to cover and a book dedicated to the quest for alternate realities. My mum traced and cut out my own shadow for me so I could work on the concept with a visual aid. I was on a role and there was no stopping me. 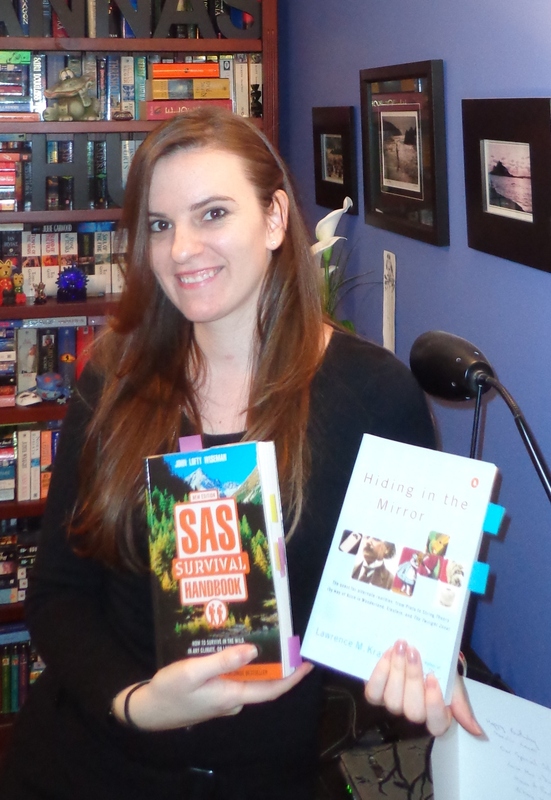 SAS Survival Guide and Hiding in the Mirror – All in the name of research! I was also lulled into a false sense of security because of this book, at the time I didn’t realise that no matter how many books you’ve written the process changes every time. I smashed book two out, passed it onto my official editor—my sister—and moved right onto book three. Initially The Shadow Series was going to be a trilogy, I had no idea of the trouble waiting for me when I began the final book. Everything changed when I started this book, I expected I would slip back into routine and everything would work out perfectly but that was certainly not the case. Since book three was meant to be the last there were a lot of loose ends to tie up. I had never worked on a storyline as complex as this, there were a lot of characters and a lot of simultaneous plots that needed to line up. I had so many notes and a clear structure of events that needed to happen in order for everything to tie together. It was really difficult to keep all those things in mind without letting it disrupt the flow of my sentences. Some of the plot points that were once blue-tacked to my wardrobe door. 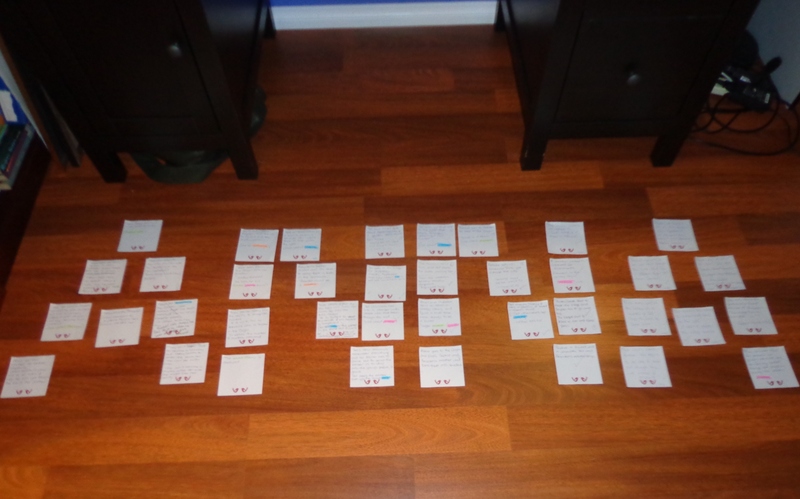 I ended up writing all the important events on individual pieces of paper, I knew all those things needed to happen but the order I initially intended for them was constantly changing. To make sure I didn’t miss anything out I stuck all those pieces of paper inside my wardrobe doors and moved them around each time the plot twisted in a direction I didn’t expect it to. During the writing of book three I had a few moments of despair, days when I started thinking I had screwed it up completely and there was no way to fix it. I was quite close to the end of the draft when I suddenly felt like I had to stop and read it, I just had a feeling things weren’t working. I remember very clearly lying on the rug in my lounge room and reading the draft, within a few hours I went from thinking my manuscript was nearly complete to realising I was less than half way. It was pretty clear to me then that I had to split the book in two. It was a horrifying moment, I just felt like months of work were completely wasted. The problem was I’d tried to jam too many things into a short space and in order to correct the pacing of the story I had to rewrite the entire thing. So I wrote it again … twice. Book three was the greatest writing challenge I have faced this far, it took close to a year to complete it but looking back I’m so glad I spent that time on it. It taught me a lot about my strength as a writer, I know now that no matter how bad it is there is always a way to fix it, I owed it to my characters to struggle through and finish their story. Of the people who have read advanced copies of the series a number of them told me book three was their favourite—it makes the whole thing worthwhile. There’s a fine line when you’re developing multiple plotlines, sometimes just a few sentences can be the difference between intriguing the reader and giving everything away prematurely. I had been leaving clues for three books, I wanted the reader to be suspicious but of course I didn’t want them to be able to guess the ending. To begin with I did get that balance wrong and my test audience picked it up pretty quickly. I have to say this is the book where the feedback made the greatest difference, I went through it at least six times picking out all those little hints that gave the wrong idea. Even up to the week before this book went to print I was still rereading the first 50 pages and making subtle changes. The writing is the part I love and it’s the dedication to the characters and the story that gave me the motivation to get through the editing and the publishing. The truth is these three aspects all hold the same value for the final product so there was no fair way to fit them into the same blog. Part II Editing the Shadow Series will be published on Saturday 11th May.